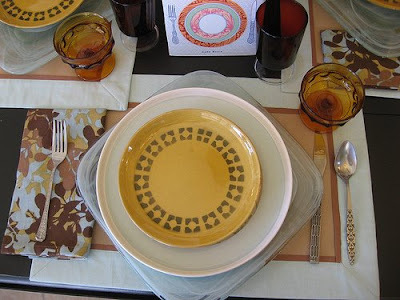 MIGNONNE: Thinking of changing your tabletop for fall? 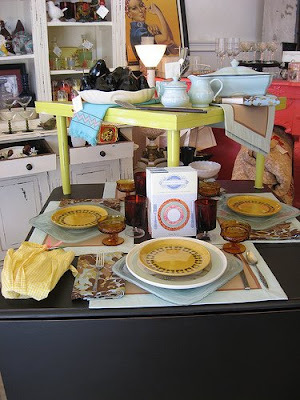 Thinking of changing your tabletop for fall? Mignonne has everything you need to update your look. From a beautifully redone dining set in matte black with 4 matching chairs with toile seats, to interesting combinations for your table top. We are all about incorporating vintage and fresh new designs at Mignonne, not only for the beauty of the mélange, but because it is gentler to Mother Earth! Take a look at this inspired combination of old and new in an interesting mix of colors (soft washed blue, chocolate browns and warm gold tones). All colors you'll see as you stroll the blocks of Old Oakland these days and observe the turning season. Shown in these photos are large, square blown glass chargers in tones of soft blue, generously sized plates with a simple bird graphic in brown, topped with vintage smaller plate (salad, dessert?) in warm gold with a geometric brown design. All of these pieces are extremely versatile and could be utilized as platters, serving pieces, or dinnerware. The table setting is displayed on pale brown linen placemats bordered in soft blue, and a bold, floral design cloth napkin repeating all of the same color scheme. We've mixed it up further with some gorgeous vintage amber glassware. You can click on the photo for a closer view. There's lots more where this came from at your favorite place for French-inspired décor, Mignonne. New Voluspa Candles at Mignonne! 25% OFF SALE During Today's Green Potluck Event! how about a weekly peek?